Another version! Just like the v3, this one uses a website, but there a couple of different features on the tamagotchi itself. The discipline feature has been replaced with a mail box which delivers messages about how your tamagotchi's day is supposed to go. You also get a career meter function. Depending on how you care for your Character, your character aspires to a certain career. 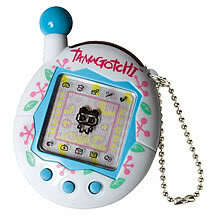 Your tamagotchi will leave the screen sometimes to go to work! Also, the lights on this tamagotchi turn off and on automatically so the light option is missing in this version and has been replaced with a treasure chest where the items are stored. There are tons more games on this one as well. I'm not particularly fond of this version though because the antenna is even more annoying than ever, I'm not impressed with any of the newer characters and I don't particularly care for the games. I'd give it a 3 and a half out of 5 as far as Connections go. 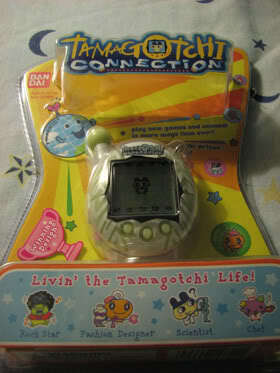 Other than that its an ok Tamagotchi and other people might love it. These can be found on eBay and run at $10-25. Again careful about the fake ones because they are super cheat so they will try to tempt you.